Katya Tabakina is the Grants Manager at NACTO. 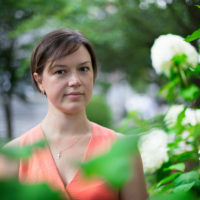 Prior to joining NACTO, Katya worked as an Associate Director of Finance at the National Network for Safe Communities, a project of John Jay College of Criminal Justice. In this role, Katya oversaw complicated grants and served as a key resource for problem solving with internal and external offices. Katya managed and oversaw the strategic deployment of Federal funding; she was responsible for the distribution of grant expenses and reimbursements; staying current and compliant with the changes in the Federal/State Regulations governing grant management; producing reports for funders; and administering, extending, terminating, and renegotiating contracts and sub-contracts. Prior to joining the National Network, Katya worked in the New York State Office of the Inspector General, where she analyzed state government expenditures, prepared investigators’ court testimony, and performed policy research and analysis for investigators, attorneys and auditors. Katya Tabakina received her BA in International Criminal Justice from John Jay College of Criminal Justice and her MPA in Public and Nonprofit Management and Policy at New York University’s Robert F. Wagner Graduate School of Public Service.